To Continue where I left off in my last post, here are a few more photos from the now closed Cleveland Trust Bank. The vault door shown on the last post was rectangular and was amazingly complex and beautiful. Here is another vault door, showing similar beauty, but this door was round. It was built by the same company, and like the other, was like a piece of art. The workings on this vault door were even enclosed by beveled glass with the center section swinging open on hinges. Though I spent most of my time photographing the details of the vaults, the bank architecture was photo worthy also. 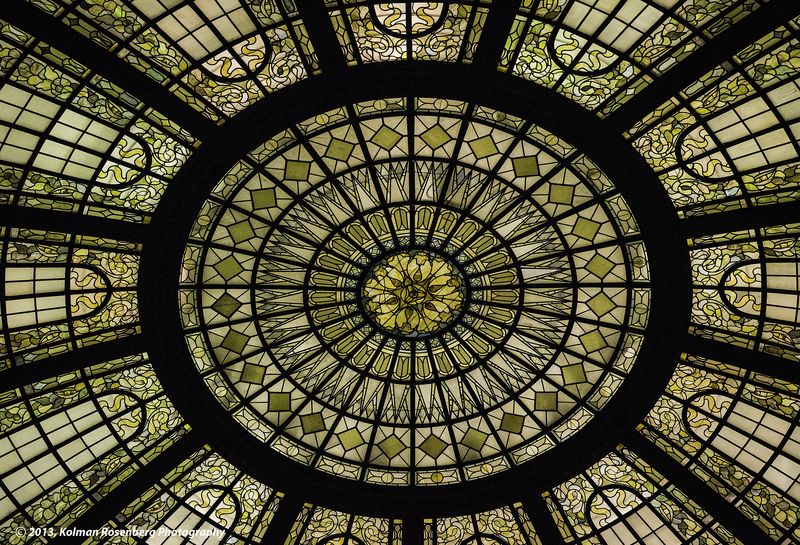 Looking straight up from the bank lobby is a sixty foot in diameter rotunda, exhibiting a Tiffany stained glass skylight. It seemed everywhere I looked in this building, beauty was abundant! 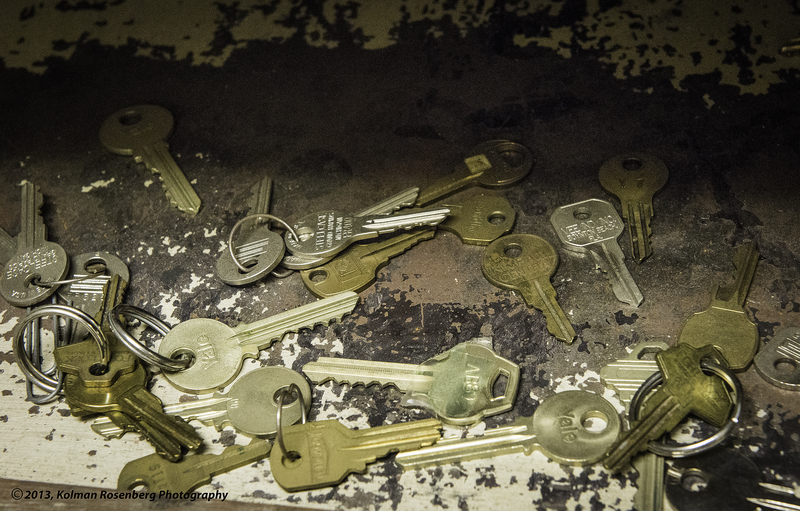 Inside one safety deposit box compartment, I found this grouping of keys. 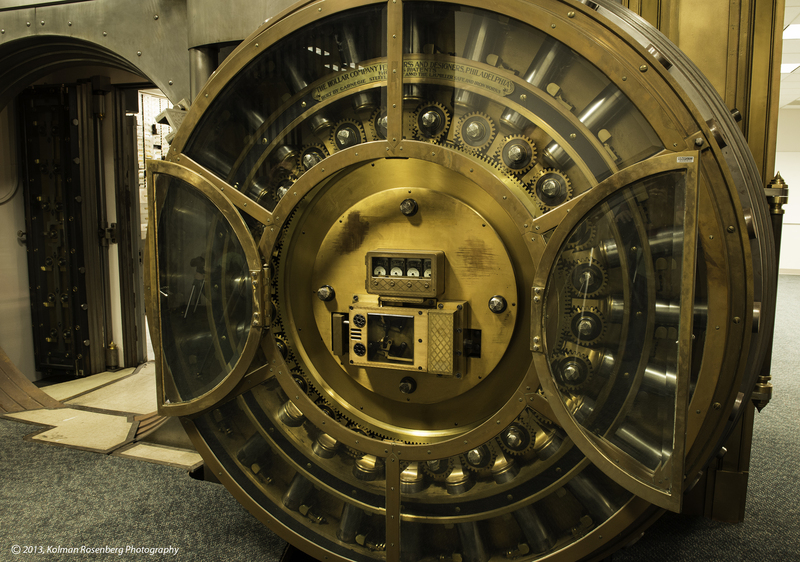 Though most of them appeared to be fairly modern, once again I was reminded of bygone years of customers and employees, doing their banking business in and out of these vaults. Some of the scenes captured just looked like time was stopped and everything was left just as it had been at that instant in time! A fascinating shooting experience! This entry was posted in Uncategorized and tagged architecture, bank, beauty, brass, Cleveland, cleveland trust bank, OH, ohio, rotunda, skylight, steel, tiffany, vault. Bookmark the permalink. Great photographs. I particularly liked the Tiffany dome. I have told my children and grandchildren that they should always check out the ceiling of the old buildings that they visit. Many years ago when I took three of my young sons and step-sons (ages 13 to 15) to Paris I told them, when we visited the Louvre, to make sure they looked up, not just at what was exhibited on the walls. Imagine my delight when I entered one gallery to find one son lying on the floor photographing the ceiling. Everybody else was looking up and I overheard several people remark that until then they had not realized how beautiful the ceilings were. Good lesson and good story Dave! I always try to look all around me! You never know where the beauty is? I have photos of people at this event laying on the floor photographing that rotunda! Oh my!! I feel like I’m going into a trance. The more I look into that dome the more I see. When I was younger the kaleidoscope was about my favorite toy. This photograph reminds me of that. It is very much appreciated. All three are great photographs. Thanks Patricia! I hadn’t thought of that but now that you mention it, it does remind me of a kaleidoscope too! I just love these! Great depth and texture. Love the dome as well! Great work! Thanks Melissa! This was quite a site to photograph! I hope they don’t just scrap it all as it is developed! I appreciate your interest in this photo and I’m glad you are using it for your desktop wallpaper. I would appreciate however if you would retain my copyright notice on it. Beautiful pictures. I understand this bank had a robbery back the early 1960’s. I had a family member who worked at the bank of the robbery. She has since passed away. Do you have any knowledge of this bank robbery or if you don’t can you possibly point me in the right direction to get information on this? Thank you for your time in this matter. Interesting Sarah! I had never heard about that and I didn’t move to the Cleveland area until 1974. I would imagine you could find out some facts on that thru a Google or other search engine inquiry! The Cleveland Plain Dealer newspaper might have info as well in it’s archives.